DRAMA!!! 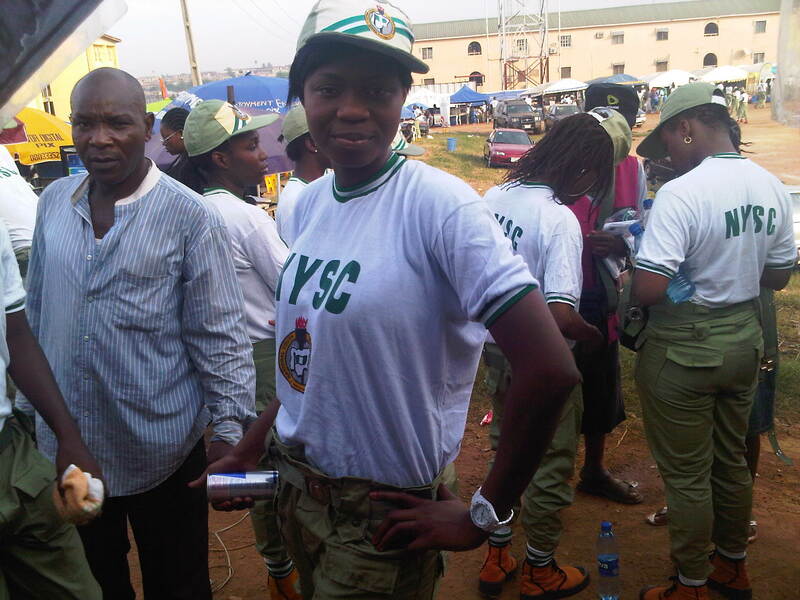 MORE FROM NYSC CAMP (IPAJA)!!! 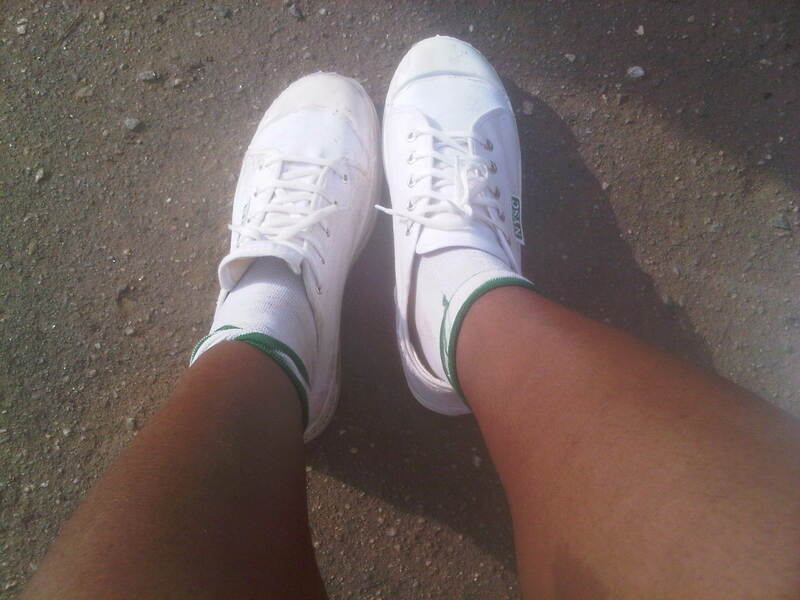 This is NYSC Day 10. I miss blogging. I miss you guys so much. Naija is fine. I’m enjoying it and I thank God for the experience. If Abuja was dramatic, then Ipaja is in a league of its own. Trust me. This place is like a mini jungle!!! The great side to the story is that you meet loads and loads of amazing people, you network and you all have a moan together about the living condition ie, being thirty in a room, the horrible bathroom and the fact that most of us did not do ‘the deed’ for over 6 days!!! Yes o! You best believe that. I have noticed a bit of foreign trained versus Nigeria-trained corps members’ ‘beef’ going on. There is a bit of discrimination because they believe foreign trained graduates are fake, thick and generally, suegbes/otondos. On the very first day, there was a foreign/naija fight. Naija won sha because foreign packed her things and left the camp the next day. The male camp soldiers are amazing. The women… I reserve my comments. If you like, wee on your body, by 4:30 am you are up and out on the parade ground! Those women are merciless. I developed rashes so I left for home for 3 days but now I’m back on the camp. When you leave camp, you appreciate everything much more so being in camp has its good sides. You are more grateful for every little benefit. NOTE: Everyone wants to toast you on camp. So please be careful when you do your NYSC. Don’t agree to any camp relationship as most of them are at best, bored and want to while away time and at worst, users looking for a fling. If he really cares, he’ll still care after camp. Be very prayerful on camp and soak all your property in the Blood of Jesus. Don’t charge your phone in your friend’s room. Just pay 50 naira and charge in Mammy market. There are thieves EVERYWHERE!!! I’m in naij next month so we gats to hook up. U still on bb? ….. Make that disposable underpants lol! 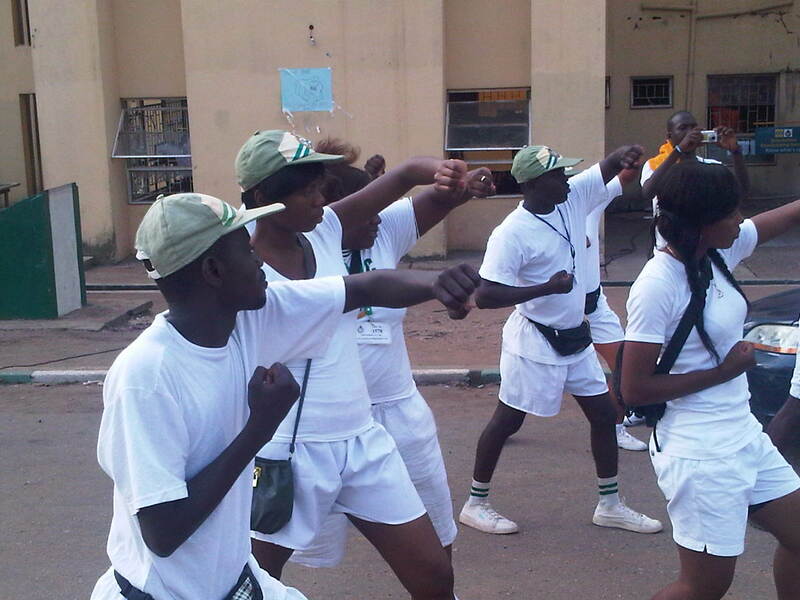 The NYSC Camp experience is in a class of it’s own. Contrary to most ppls view of it I had so much fun when I did mine. Looks like you’re having fun too. lol, pele @ Temi,Otondo i bet you were not told or least expected you will enter camp and be given your own studio appartment?. But instead was paired with up to 30 people in a room yours was better mine we were 70 in a room. it was worse for me cos it was during the rainy season with leaking roof dat made all men sleep on limited bed clustered around each other like park of sardines in a can. As for bathing or toilet? am not surprised. dat aspect naija will not change get used to it for the remaining days. lol wat an experience for you. You still have endurance treak to do before camps over prepare to walk long distance journey. Have fun enjoy the drills! Those your jungle boots look like 2 left legs! abi na 2 right legs. please give us more gist about camp!! Those jungle boots are the bees knees. Good luck and have fun. LOL….Your assessments are spot on…Camp moments are an unforgettable experience….ENJOY!!! it’s so good to see that you are enjoying your camp experience…miss you so much dear. Thanks for these updates of yours…they are quite useful and helpful…I’ll be needing it later on this year. lol…@ the jungle boots…yep they look jungle.. keep having fun in camp… I agree more indepth highlight on the foreigners graduates/niaj fight… i didn’t really get it the story..
the only thing i can say or do is hehehehehehehe! lol @ Red Bull and charge your phone at Mammy. I did my NYSC in 2005 at Enugu and it was quite an experience. Its similar to what you have described and its kinda sad that not much, if anything has changed in 5 years. I can say though, that try and enjoy the brief period that you spend there. I met some great people there that developed to lasting friendships. Did I mention that they served ‘donkey’ meat at my camp’s Mammy market? Nice Blog too. So inspirational. Keep it up. Temi darling, Been itching to hear ds gist. Good to know u’re avin fun. NYSC camp experience is in a world of its own. stil itching to hear d rest of d gist ooo. lol…. 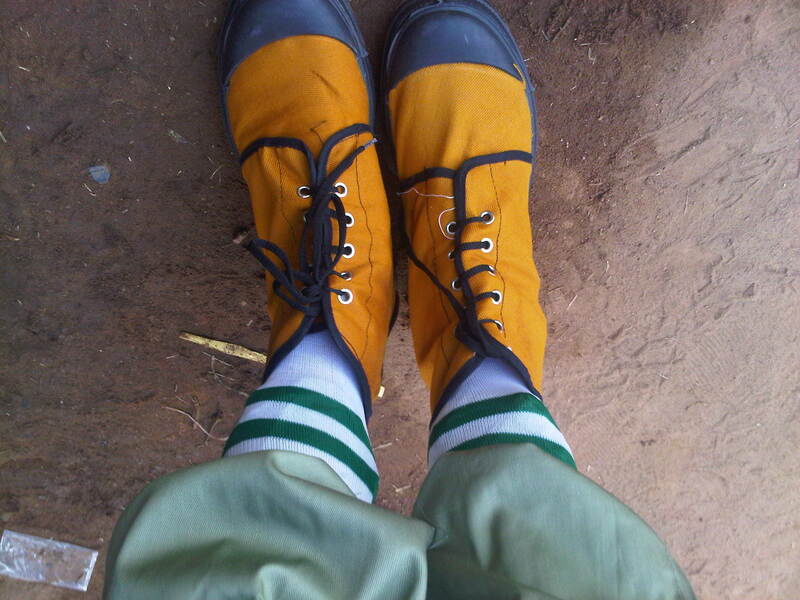 Temi, c ur feet in those jungle boots like a squirrel’s … hehehe… Lemme console u, mine was like “ugggllliiieee”! What platoon u in? Was in Lagos camp late 2009, platoon 10 had loads of foreign trained. Is it still d same? How’s Mammy food… indomie, toast n all that…. These two sisters had a joint called “Perkish”, i think. Them they try with food sha compared to others… hp u find them there. hahaha…..LMAO………enjoy babes…enjoy…..i really got tired rtye from d second week… was d band dat kept me going…..d lovely songs…d lovely beats,,got to learn ow to play sm instruments..then d final parade… marching with d band was d fun part and swell for me…….besides it kept me from jogging and all d boring lectures…..
Aint you lucky? I did mine in Bauchi State and for the first few days you have to take your bath in the open like 3-4am both male and female side by side. Our hostel was the abandoned primary school in Wailo Ganjuwa Local Govt. Damn! Those boots look ‘lovely’on ur feet. I still can’t understand why students who studied abroad shd be made τ̲̅ȍ come back απϑ serve in naija. Walai, I no for show.One thing is for sure, I’ll be checking back for more.Have fun.